A few weeks back I posted photos of my girls making Fried Pies with my Mom. We were carrying on the tradition passed down to us by her Mom but every since Grandma has passed on we knew there was something not quite right with the pies. The dough was off. I now know why. The video does not give amounts for her recipe but more of a "this is how it's done." I, on the other hand, am going to share the recipe I made to make these delicious pies - but first a few pictures. Yummy fresh apples from the farmers market. 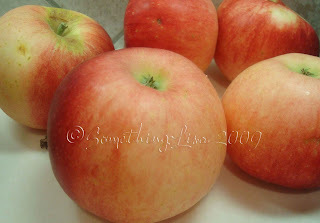 I used these Jonathans mixed in with a few Granny Smith's from my Mother-in-laws tree. The apples are cut up and cooked down to make the filling. . . this is what was left after I filled the pies. 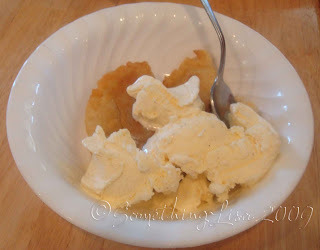 We enjoyed it straight from the pan as well as a some over vanilla ice cream. 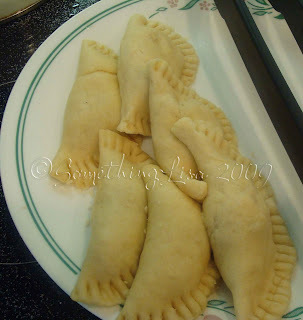 Here are the unfried pies. . .
And the best part, of course, is the eating! and so we followed his advice. Core, slice and peel apples. I like to use the same corer/slicer I use to cut up apples for the kids and then use my paring knife to peel the apples. I then cut these pieces in half so they are chunky. Put the peeled apples pieces into a 3 qt or larger pot, with the butter. Cook on medium to low heat for about 20 minutes with the lid on the pot. Make sure to stir the apples every five minutes or so to make sure the heat isn't too high and to see if they are softening up. 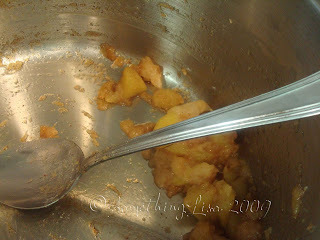 Once your apples are soft you can break up some of the apples, but leave some chunks too. I suppose this is really a personal choice. Add about 1 Tbsp of Cinnamon to the apples and stir. Taste the apples to see if they are already sweet enough, if not start by adding a couple tablespoons of sugar and then tasting the apples as you go. Let the apples cook another minute over low heat and then remove from heat. If your apples are soupy you can add a tablespoon of cornstarch. I personally haven't had this problem. Measure flour and shortening into bowl. Add 1/2 cup of milk and stir together with large spoon. If the mixture is dry and doesn't come together in a nice ball after stiring add a little more milk until it forms a ball. On a well floured surface briefly knead dough. Roll dough out very thin. Cut out circles. I have a 4" diameter circle cutter that I used. The woman on the video cut around a small saucer and so her pies are larger than mine. The size of your circle will determine the amount of apple you place in the middle of the pie. You will need enough filling to fill half the circle and leave a small amount to seal the pie. Once filling is in circle, fold the dough over the filling and seal the edges with the tines of a fork. Put skillet over a medium heat and add about an inch of oil. I use a combination of canola oil and shortening. The woman in the video uses Lard. This is definately not a diet food! 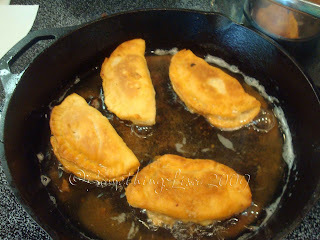 The oil will need to be replenished as you fry the pies because the pies will absorb the oil. I test the heat of the oil by placing a corner of a pie in the oil. If bubbles form around the pie edge then the oil is hot enough. Do not overheat the oil. Watch the pies as they cook and turn over once they are golden brown. Remove pies from oil and place on paper towels once both sides are cooked to absorb excess oil. Hey Lisa! Thanks for the recipe. We were in Tennessee for the holiday weekend and unfortunately my Great Aunt doesn't cook much anymore but we did have some Fried Peach Pies at the Casey Jones Village in Jackson. Yummy!! I'll have to try these with the apples and then try some peach. Love peaches....Aunt Rachel also gave me a huge 5 gallon bucket of pears to bring back and I am going to try making her pears in a sugar syrup, not really a preserve or jam, but very yummy. Girl, how do you dare eat those delicious things. The fat will kill you if the flavor doesn't!